If you’re looking for an attractive landscaping idea, you should consider having a gazebo put into your yard or garden. A gazebo is a great addition to any yard because it provides a place for people to congregate, which in turn promotes conversation and community. There are a number of things to consider when looking at gazebos, the first of which is the flooring. You can choose a gazebo with a wooden floor, or one that has no floor at all. If you choose the gazebo design without the built in floor, it’s still wise to implement some kind of stone or brick-work surface that you can stand on. 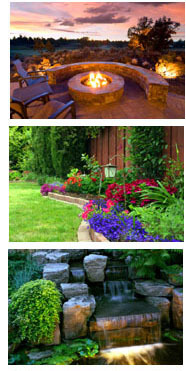 It can be a color and texture that also goes well with that portion of the yard. The gazebo with a built-in wood floor is nice because it gives the gazebo a consistent appearance from top to bottom. The floor can be made of the same wood that is used for the gazebo’s structure; cedar is often the best choice, since it is a resilient but light wood that weathers beautifully, taking on a nice silver hue over time. As far as placement is concerned, a gazebo can be built almost anywhere in the yard, even placing one on a deck. Again, cedar is one of the best landscaping ideas here for its light weight. If this is done, you will typically need to add extra support below the deck. The extra support posts should be sunk into the ground, where they can be made firm with concrete or dirt, or they can be supported by above ground piers. For roofing options, you can choose from structures that consist of either a single roof, a two-tiered roof, or a roof with three tiers. Attached to this roof, you may want to consider an insect screen, which is a mesh screen that stretches down from the roof to the edges of the gazebo. This will keep insects out while still allowing sunlight to get in.